Mort Kunstler Hand Signed and Numbered Limited Edition Print:"World Turned Upside Down"
Size: Print: 18" x 29-1/2"/ Overall Size: 23" x 33-1/2" / Canvas: 20" x 33"
Edition: Artist Signed and Numbered, Limited Edition with COA. 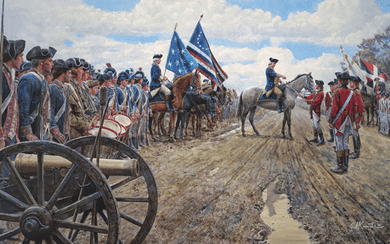 Mort Kunstler's Comments: In the fall of 2005, the U.S. Army War College's Class of 2006 Gift Committee asked me if I would be interested in a commission to paint the surrender at Yorktown. To be able to accurately paint an event of such enormous importance was a wonderful opportunity. I've had an interest in this subject for a long time. Back in the 1970s, I did two small paintings on the surrender, and since I always wanted to do a major painting on the subject, I accepted the commission. I contacted Diane Depew at the National Park Service in Yorktown and John Giblin of the Army War College to help with the details. "The World Turned Upside Down" places the Continental troops on the left with their artillery in the foreground. This is the way the scene would have looked to a British soldier standing in the road, waiting to march between the line of American troops, and French troops seen in the right background. It's a different perspective from earlier artworks of the topic - and one that I think gives us a fresh view of this pivotal historical event. The commander of Washington's French allies, General Rochambeau sits astride his horse on the extreme right, with the flags of his Soissonnais Regiment fluttering above him. To his left, Washington's aide, General Benjamin Lincoln - mounted on his grey charger - accepts the surrender from British General Charles O'Hara. General George Washington, is seen mounted to the left of his personal headquarters flag, the blue banner with the white stars. The flag with the unusual arrangement of red, white and blue stripes seen immediately to the right of Washington's flag is a well-documented early American flag of the period. The helmeted troops on General Washington's right are the elite Life Guard, who served as the general's personal guard. After the surrender ceremony, the British had to march a mile and a half to finally lay down their arms at what became known as "Surrender Field" - now a national historic site. Although the Yorktown region had been drenched with torrential rains two nights earlier - as indicated by the puddle in the foreground - the day of the surrender was described as a beautiful, clear day with lots of white, puffy clouds. The puddle is also used as a design element, to act as a pointer that guides the viewer to the painting's center of interest - General O'Hara offering the sword of surrender to General Lincoln. I really enjoyed painting "The World Turned Upside Down" - it was a nice departure from the usual Civil War subjects I have been doing and I hope it proves to be a long-lasting reminder of our hard-won American freedom.